I first came into contact with them maybe three years ago when they started helping out in the youth group at our church. At first it was just Megan, but then eventually Matt joined in as well after we spent a week at their house breaking chairs and fire pokers… and doing some public service and fellowship as well. Ever since that first week there where we got to know each other very well, I’ve been in love with this family. Since that time, we’ve done more service, played more truth or dare, shared in devotions, discussions, and incredibly deep conversations over the course of many youth group meetings, campouts, and events over the years. We’ve laughed and cried, worked and rested together time after time, sharing in many adventures, struggles, and trials through the lives of my family and theirs. We’ve served together in our own town and out of country, and they’ve shown me what it means to love and to serve through everything they’ve done with me throughout our time together. 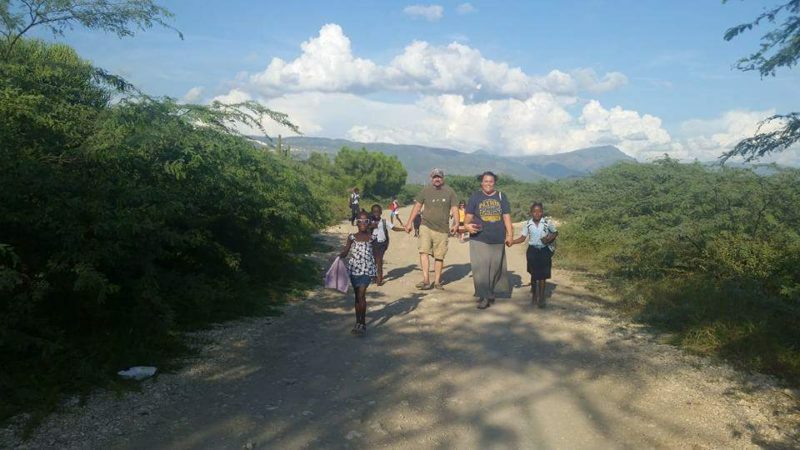 The biggest experience we’ve shared in, though, was our trips to Haiti. I’ve already shared about those elsewhere, so feel free to read about the impact those had on my life in other posts. Know, though, that they were the ones that made it possible to go on those trips, and they are the ones that brought me to the place that I learned what joy was for the first time. That experience will never be forgotten, and it is an eternal gift that they have given me. They showed me my home, and that will stay with me forever. While we were in Haiti, I got to live life in a place that seemed so utterly different than my previous home. I got to experience joy, hope, love, and peace on a whole different level than I ever imagined. I got to swing a pickax beside Matt, talk with Megan in the dining hall, and play cards with Gracie. I rode in a packed tap-tap on top of boxes of supplies while Megan made sure I was gonna be safe. I built shelves with Matt back in the states, and swam with Gracie in her pool and at the Haitian beach. These are memories and experiences that have shaped who I am today, and I say it sincerely when I say that I would not be the same man I am today without them. They have guided me through tough times, taught me the word of the Scriptures, and talked with me about any questions or struggles I had. They haven’t just impacted me, though. No, they’ve been hard at work touching the lives of many in our community and beyond. Most notably, at least to me, though, is the impact they’ve had on the kids in our youth group. When they started their time teaching us, I doubt they could imagine the bond we’ve all formed under their guidance. They’ve taught us how to love one another, how to read and wrestle properly with topics in the Bible, and talked with us about every struggle and difficulty imaginable. They’ve gone with us to nursing homes and parks, foreign countries and local soup kitchens, and we’ve learned to serve others through experience. We weren’t merely taught from a book, we were shown. Every day of their lives, they’ve lived out the lessons they’ve tried so hard to ingrain in us, showing us how to love others near and far, not only through words, but through actions and relationships, coming alongside others and loving them wherever they are. They’ve sacrificed much to help our youth group and many others, spending sleepless nights, blood, sweat, and tears, giving everything they have to bring the love of God to everyone they meet. No price has ever been too great for them to bring a just a little bit of light to those without it. They haven’t just gone through the motions of the typical American Christian. They weren’t content with so cheap and empty a life. No, they have given all that they are here in the states, loving and serving everyone they have come into contact with, and I cannot thank them enough for their determination through all opposition. I know that they will give even more in the service of our Savior when they get to Haiti. I continue to tell about everything they’ve done for me and my youth group and my family, but that would take much more than than these few words can contain. So, I must stop here, but I know more will be told of everything they do in Haiti, and wherever God decides to bring them next. This isn’t a goodbye, because I plan to make regular trips down to you, but know that you will be dearly missed by hundreds, if not thousands, that you have made an impact on back here. Goodbye, for now, and may God use you for much greater things than we can even imagine with our tiny human minds. Beautiful tribute to a dear and godly family! Praise God that they were/are so influential in your life and in the life of so many(my daughter included)! Praising God in advance for what he will do inand through them in Haiti! Eloquent and moving tribute to this wonderful family. I thank God that He brought them into your life. What a wonderful tribute to our dear friends. I have always admired how they live their faith. The best teaching usually comes through the everyday example of good people. I don’t really know the Hickeys except through what you and your mom have said about them, but they sound like people worth knowing. I’ll certainly be praying for them while they serve in Haiti. Darrel, as someone who joined Matt and Megan on the first few trips CCC took to Haiti and as someone who became their friend as well, I can concur with all you have said here. As Nehemiah Vision highlights Genesis 12:1-3, the Hickey family truly is blessed and are a blessing! Wonderful tribute!